Well done to David Harry – this is indeed on the front of the Foundling Museum in Bloomsbury and is a bust of the Foundling Hospital’s founder Thomas Coram. 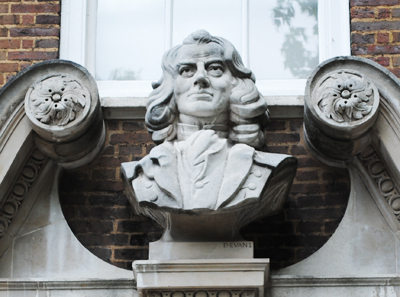 For more Coram, see our previous Famous Londoners post. I think its at the Foundling Museum?